They created a campaign to encourage people to adopt good dogs because sheltered dogs are usually dogs that are abandoned by either an irresponsible owner or by people who could not afford to raise them any further. From here, Pedigree told a story through the campaign to convince people that the dogs that ended up in the shelters are not their fault, but instead, it is because they were unlucky to be owned by the wrong people. In order to tell the story, Pedigree used stories of two real dogs (instead of dogs that are “actors” or familiar with the cameras) and worked with them throughout the campaign. Pedigree targets families with children who love dogs and people with an active lifestyle. The brand would also like to target new consumers who want to look for their first dog or already have a dog but have never heard of Pedigree. What problems they want to solve? People who visit the animal shelters tend to think that the dogs kept there are due to bad behaviors or that they are sick. Therefore, Pedigree wants to change that mindset and show people that these dogs are harmless and they only need to fall into the right hands. The dogs need to be taken care by the right owners that they deserve. Since it was difficult to get people to the shelter dogs, Pedigree decided on bringing the shelter dogs to the people instead. What is the brand purpose? Pedigree hopes to create a strong relationship with their consumers through their adoption campaign. They use channel-centric process to integrate their market by having their consumers from different channels to connect with one another. Bottom-up model is used for this campaign because they started off by having a campaign called “Underdog Day”. Through that campaign, people were driven to their online website and started adopting dogs online. 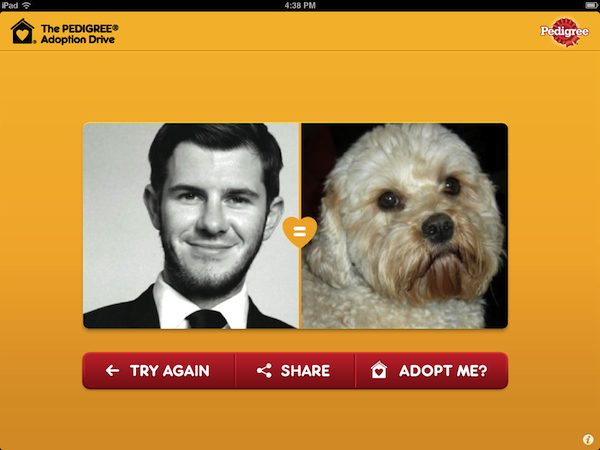 Besides that, they also had an app called “Look-A-Like” where consumers get to choose dogs that look similar to them. Through this app, many people started sharing it over social media such as Facebook and Twitter. Later on, the campaign was broadcasted on television, hence getting people to talk about it as well. A case study for the Pedigree: Adoption Drive we created with Proximity Canada. See the final video here: https://vimeo.com/31618441. Dove created a partnership with Twitter for a social change. Speak Beautiful was created to encourage women that they are beautiful just the way they are. During their 60th birthday, Dove posted a hash-tag post on Twitter: #RaiseTheBeautyBar. Dove’s primary market are women aging from about 18 to 35, where women tend to be more self conscious about their skin and about how they look. Men are Dove’s secondary market because research has shown that men also care about the condition of their hair and skin but women are more concerned than men. Dove discovered that women think of themselves negatively. Most of the time, these negativities are expressed through social media, especially Twitter. In 2014, there were more than five million negative beauty tweets being posted on Twitter. Dove wishes to help women be more positive about them, and think more highly upon themselves. The brand also hopes to guide women to reconsider and redefine what beauty actually means to them. The campaign is measured through the recruitment model because Dove first posted their “Dove Real Beauty Sketches” video on YouTube and used Twitter to tweet their #SpeakBeautiful hash tag posts. From here, it got people talking about it and it created a strong impact on women’s view about their own bodies and their looks. Coca-Cola didn’t have much success turning nasty tweets into nice ones as part of its Super Bowl campaign. But now, Dove—in partnership with Twitter itself—will try to do something similar during Sunday’s Academy Awards. And perhaps most crucially, this effort—unlike Coke’s—won’t be automated.